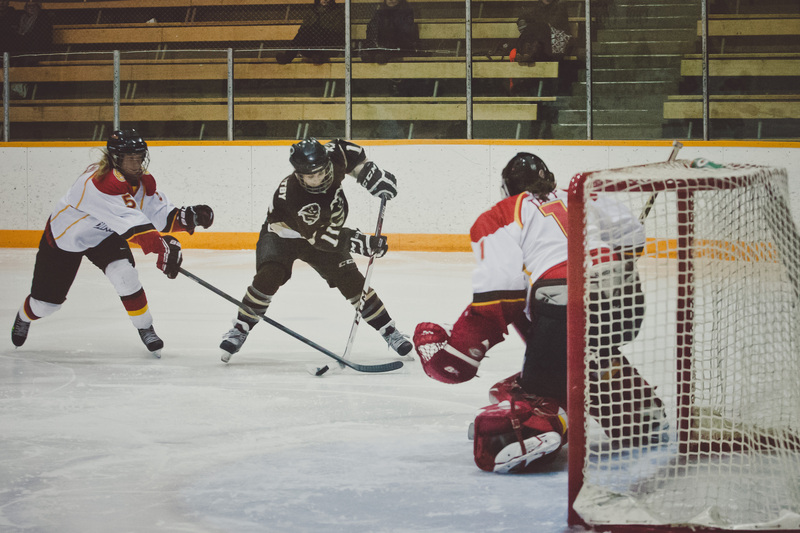 This past weekend there were heavy playoff implications for the Bison women’s hockey team. Sitting just five points out of top spot in the conference, Manitoba secured three of a possible four points in two games against the visiting Calgary Dinos. On Friday night, Manitoba carried a 3-0 lead halfway into the third period, holding on down the stretch to pull off a 3-2 victory. The Bisons roared to a thunderous start, scoring just 43 seconds in on their first shot of the game. Kyleigh Palmer, on a points streak dating back to Nov. 30, zipped into the Dinos zone with the puck, found Rachèle Bosc with a pass right onto the tape, and Bosc put it into the back of the net. Both teams tightened up their plays defensively, as Manitoba took their 1-0 lead into the second period. The home team was able to loosen up the Calgary defence in the middle frame, generating a number of quality chances. Amanda Tapp stood strong in net for the Dinos, keeping this one close. Tapp’s play in net seemed to wake up the visitors as they dictated the pace over the last 12 minutes of the period, though they could not crack the scoreboard. The third period was filled with action as both teams picked up the intensity looking to put away the win. Maggie Litchfield-Medd carried momentum from a Bison scoring chance in the dying moments of the second period, putting away a Palmer rebound only 2:02 into the final frame. Just 13 seconds later the Bisons added to their lead, Kayleigh Wiens scoring on a mad scramble in the Calgary zone. After falling behind 3-0 with two goals in the first two minutes of the final period, the Dinos made a change in net. The decision appeared to spark their offence, as Jessyka Holt scored at 9:17, followed just over a minute later by Calaine Inglis at 10:36. The play of the game occurred in the final 10 seconds. With the Dinos on a 6-on-5 advantage and their net empty, Amanda Schubert was forced to lunge across the crease, absolutely robbing Calgary of the game-tying goal and preserving the win. “[Schubert] made a couple key saves in tight at times, and I thought she managed her game pretty good,” said head coach Jon Rempel post-game. In the rematch the following day, Manitoba let an early lead slip away, losing 2-1 in overtime. Calgary opened up the game with intensity, drawing a Bison penalty which allowed the Dinos to generate several solid scoring opportunities. Manitoba stayed composed, killed the penalty, and dominated play for the next seven minutes. 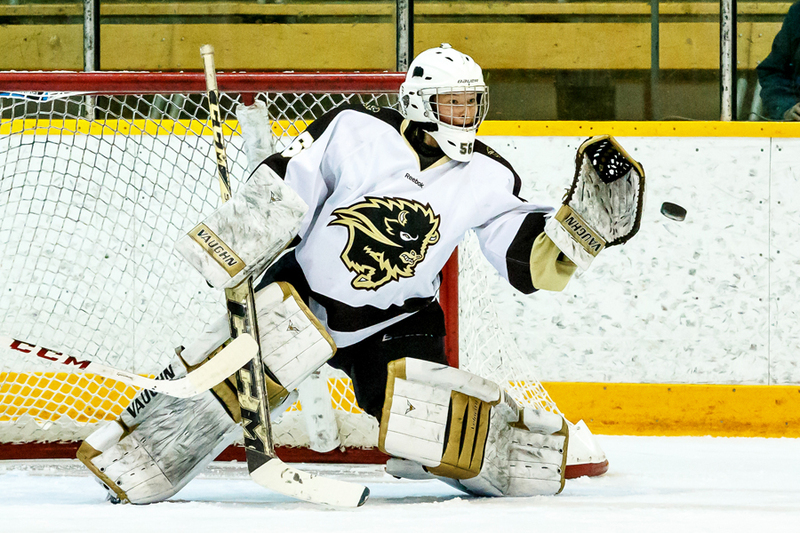 Just like on Friday night, it was Kyleigh Palmer who stepped up early for the Bisons. She skated in with the puck on a brilliant rush that was finished off with a goal from captain Amy Lee at 11:52 to give the Bisons the lead. Both teams had chances on the power play in the second period, but neither could find the back of the net. Manitoba outshot the Dinos 10-6, maintaining their 1-0 lead going into the third. Manitoba goalie Dee-Ana Marion had her shutout bid snapped at 6:12, as Calgary’s Erika Mitschke had her shot redirected off of a Bison stick. Calgary pushed the pace from that point on, keeping Marion on her toes, but could not take the lead. The Bisons got one last chance in the final seconds, but Tapp robbed Palmer with a big shoulder save. Sarah Astle ended things at 3:25 of overtime for Calgary, completing the comeback by going five-hole on Marion. The Bisons travel to UBC next, taking on the Canada West’s top team in a crucial series on Jan. 24 and 25.